What Pain Medications Are Safe For My Heart? The skeptical cardiologist is frequently asked by patients if it is OK to take certain pain medications. What Is The Risk Of Pain Medications? Cardiologists have been concerned about the increased risk of heart attack and heart failure with non steroidal anti-inflammatory drugs (NSAIDs) since Vioxx was withdrawn from the market in 2004. NSAIDS have long been known to increase risk of gastrointestinal (GI) bleeding by up to 4-5 fold, Scientists developed Vioxx, a COX-2 inhibitor, hoping to reduce that risk but Vioxx turned out to increase the risk of heart attack. -ibuprofen (in the US marked most commonly as Motrin or Advil, internationally known as Nurofen). For extensive list of brand names see here. Since then, hardly a day goes by without me having a discussion with a patient about what drugs they can safely take for their arthritis. This table and many authorities recommend naproxen as the NSAID of choice for patients with high CV risk. Indeed prior to the publication of the PRECISION study in 2016 I believed that naproxen was the safest NSAID for my cardiac patients. I told them it was OK to use from a CV standpoint but to use the least amount possible for the shortest time in order to minimize side effects. The PRECISION study compared a COX-2 NSAID (celecoxicib or Celebrex) to ibuprofen and naproxen in patients who required NSAIDS for relief of their joint pain. cardiovascular death (including hemorrhagic death), nonfatal MI, or nonfatal stroke, occurred in 2.3% of celecoxib-treated patients, 2.5% of the naproxen-treated patients, and 2.7% of the ibuprofen group. There was no placebo in this trial so we can only look at relative CV risk of the three NSAIDS and it did not significantly differ. GI bleeding was less with celecoxib than the other two NSAIDS. Although this study has flaws it throws into question the greater CV safety of naproxen and suggests that all NSAIDS raise CV risk. It’s a reasonable approach for these OTC drugs and I will start handing this out to my patients. We should consider that all NSAIDS have the potential for increasing the risk of heart attack and heart failure, raising blood pressure, worsening renal function and causing GI bleeding. Therefore, if at all possible avoid NSAIDS. 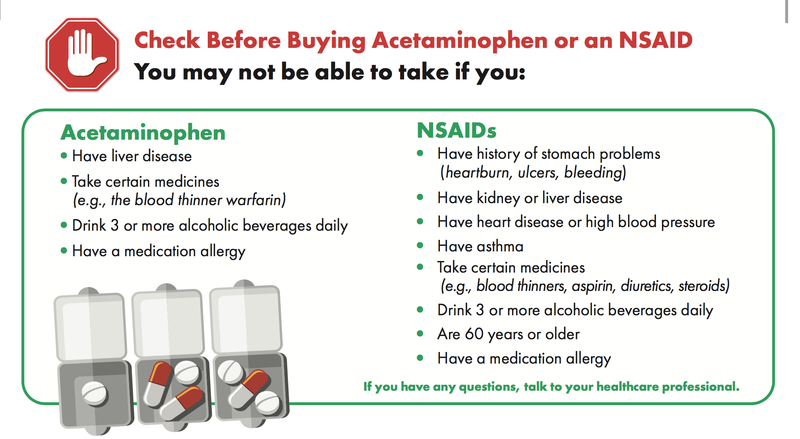 Acetaminophen (Tylenol) is totally safe from a heart standpoint and overall if you don’t have liver disease it is your safest drug for arthritis. However, it provides no anti-inflammatory effects and often is inadequate at pain relief. Meloxicam is an NSAID so my patient should , if at all possible, avoid it. The other drug he was prescribed, tramadol, is an opiod. Opiods have their own set of problems including, most importantly, addiction and abuse. reliable conclusions about the effectiveness of long-term opioid therapy for chronic pain are not possible due to the paucity of research to date. Accumulating evidence supports the increased risk for serious harms associated with long-term opioid therapy, including overdose, opioid abuse, fractures, myocardial infarction, and markers of sexual dysfunction; for some harms, the risk seems to be dose-dependent. As his cardiologist I am concerned about his heart, of course, but a good cardiologist doesn’t just focus on one organ, he looks at what his recommendations are doing to the whole person. I certainly don’t want to have him become addicted to narcotics in order to avoid a slightly increased risk of a heart attack. On the other hand, the risks of the NSAIDS involve multiple organs, most of which don’t fall in the domain of the cardiologist. My patient’s risk of taking either the meloxicam or the tramadol is best assessed by his primary care physician, who has the best understanding of his overall medical condition and the overall risk of dangerous side effects from these drugs. Ultimately, I think the decision of which pain pill to take for chronic arthritis has to be made by an informed patient in discussion with his informed (and informative) primary care physician. Only the patient can decide how much pain he is having and how much risk he/she wants to assume in relieving that pain.